That person’s score should be a 6. But it’s not. And the reason is because they made one minor mistake with their overview. Writing that does not have an overview at all gets 5. Writing that does not have a clear overview also gets a 5. There’s one minor mistake that makes a major difference and stops the vast majority of students every week from writing a clear overview. This happens with every type of graph (maybe 75% of the time) but almost 100% with tables. The graph below shows the average number of cups of coffee drunk per minute per person in three countries in 2000 and 2010. People in Nepal drank the least coffee in both of the years while Indonesians drank the most. The graph below shows the number of tourists (in thousands) visiting different attractions in the United States in 2004 and 2017. Trump Tower had by far the highest total number of visitors in both years surveyed while the Grand Canyon accounted for the lowest number. The problem with both these overviews is that they just mention the top and the bottom, the high and the low. That is not an overview – it is only the two key areas. Both of these students will get 5 for Task Achievement even if the rest of their writing is absolutely amazing. That’s because the overview requires an overview of all the information. It is not a summary. It is not writing about the main factors. It is like a bird flying over a field seeing everything. You must include everything in your overview or it doesn’t count as an overview. Are all countries mentioned? Are all tourist attractions mentioned? If not, it’s not an overview. Task Achievement = 5. What can you do to make sure that you include an overview of everything? Think of your overview as two sentences, not one. People in Nepal drank the least coffee in both of the years while Indonesians drank the most. Vietnamese people occupied the middle position. People in Nepal drank by far the least coffee in both of the years and there was a slight decline over the years while Indonesians drank considerably more than both other countries, including a small upward trend. Vietnamese people were almost directly in the middle in terms of coffee consumption and there was no change over the years. You can still mention the top and the bottom as the main information. Just include one more sentence so that you write about everything. Trump Tower had by far the highest total number of visitors in both years surveyed while the Grand Canyon accounted for the lowest number. The middle posititions were occupied by Yellowstone National Park, the Golden Gate Bridge and Disneyland. Trump Tower had by far the highest total number of visitors as well as the largest rise in both years surveyed while the Grand Canyon accounted for the lowest number and experienced a small drop off. Trump Tower’s popularity was followed distantly by three attractions with roughly similar numbers: Disneyland, Yellowstone National Park, and the Golden Gate Bridge (the only one of the three to also have a downward trend). The extra sentence does all the extra work! When you get to the overview in your Task 1 Writing – slow down. Open your eyes. Write your overview. Then go back to the graph and tick all the areas to make sure that everything has been mentioned. Once you have done this, you know you will get at least a 6 for Task Achievement and the score you deserve. 4 Comments on "IELTS Writing Task 1: The Mistake 99% of Students Make with Overviews for Tables"
Overall, while people in five countries mentioned spent the most money on food, drink and tobacco, the least amount belonged to education and leisure activities. Clothing and footwear, slightly higher than education and leisure, were in the middle. Great – you got all the important information in Hao! 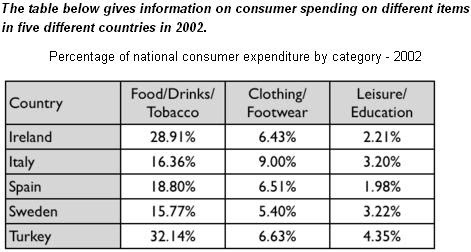 There is a clear trend in 5 countries with most money being spent on Food/Drink and Tobacco, followed by clothing/footwear and Leisure/Education in descending order. Ireland and Turkey came out on top in spending for Tobacco/Food/Drink with figures almost double that in other countries. Italy ranked first in spending for Clothing/Footwear while Turkey topped others in Leisure/Education.